An origami box seemed like an easy project for testing yesterday's stiffened fabric. The material folded nicely, and pressing the creases with an iron as I went along made even sharper edges. 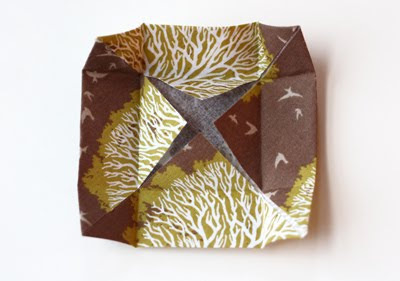 In case elementary school was eons ago and you've forgotten how to make a simple origami box, here's a refresher. 1. 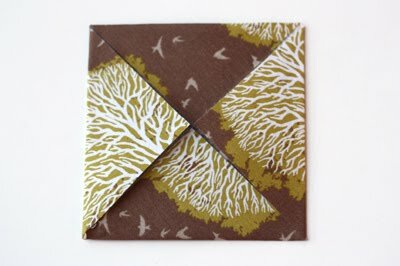 Mark the center of the square by folding the fabric into quarters or measuring. Bring each corner of the fabric to the center point and press the creases. 2. Bring one edge of the resulting square inward until it touches the center point and make a crease. Repeat with the other three sides. You'll end up with four creases running through the square. 3. 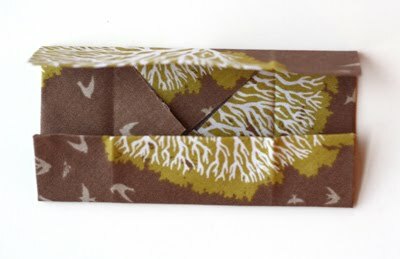 Open up the top and bottom triangular flaps, leaving the side flaps folded in. Then pinch the sides of the top flap inward. 4. Bring the point of the top flap over the "wall" you just made and press it down to the bottom of the box. 5. Repeat with the opposite flap. My box stayed folded all by itself, but you could add a couple dots of glue to secure the flaps if needed. Make a lid for the box using the other piece of fabric. The lid will need to be slightly larger than the bottom, so when you get to step 2, don't fold all the way to the center point. Fold each side to a point a quarter inch short of the center. Stitch a decoration to the lid if you're feeling fancy. this is so cool! that's so fun to think of fabric in such a different way. Ohhh, how neat! I never thought of that. I learn all sorts of interesting things from your blog! I want to do this right this very second. Lovely. I haven't made these boxes in years. I used to make them from discarded wallpaper sample books for my mum's store. 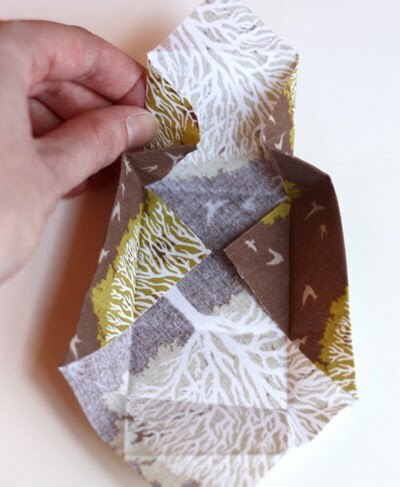 What a great idea to use fabric for Origami! In Kindergarten times. It's a great gift box, good for storing small things as sewing stuff and small things for bookbinding. But never ever remade one from fabric! i love this idea, i love making custom packaging. my girlfrieds b-day is coming up and i plan to make her a ring...this would be a perfect gift box! Great idea for the stiffened fabric! Love it! I love this idea! 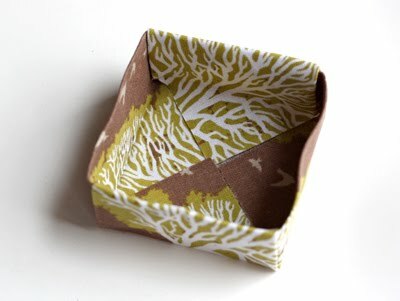 I've made origami boxes, but never thought of using fabric. Thank you! this is so cute!!!! Perfect for giving jewelry as gifts! That is too cool--I love it. What a fun way to use fabric! Aw, I haven't made one of those little boxes in many years! So, is the stiffened fabric any different than using paper? I mean, does it "perform" about the same? I suppose it'd be nice in that it wouldn't tear like paper would. Oh I love the box! I have fabric stiffener and never really knew what to do with it besides using it on fabric flowers. Thanks! It`s so cute!!! I can't wait to do it! Thank you! Cute idea with the fabric stiffener; I've actually never used stiffener before! I've always loved making these classic boxes, and often make them with solid color oak tag paper thickness to make it sturdy. 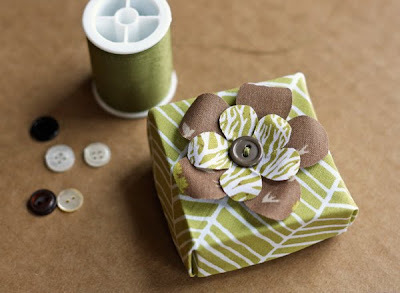 Such a fantastic and eco-friendly gift box idea!! Too cute! You inspired me to try a project with the ribbon stiff I had, but it didn't work out quite like I'd planned! I'll try again! Love the box! Very pretty! 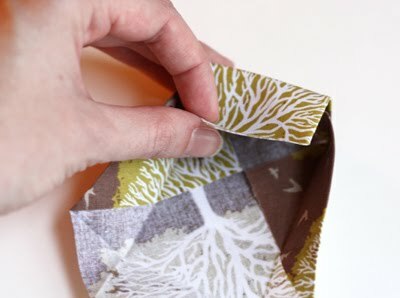 Love making these with patterned paper, too! fabulous... i'm imagining some valentine's fabric & make a few boxes with a tasty treat inside. Love that you share your talents! patterns! tricks of the trade! 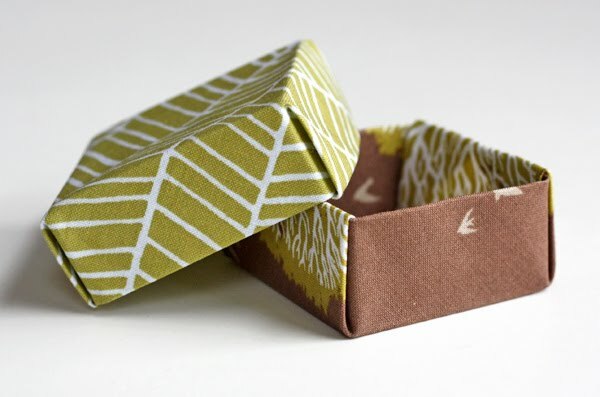 I can't wait to try this to make little gift boxes. I love your blog, and I am sorry I don't comment more often. Thank you for so many wonderful ideas. I'm more interested in the flowers on top of the box. How did you make those? aslo would love to know about making the flowers on top. When you posted the stiffened fabric my first thought was "origami!" and then I became intimidated. How cute would these be at a wedding? Super cute! As an interior designer I have tons of discontinued fabric squares hanging around this is a great project for them!! Very cute, I used to make these when I was a kid. ahhh! Thank you! This is perfect for the socks I knit for my family members birthdays. So pretty and neat! I would like to try it. Your blog is so inspired me. i used to make these boxes with my grandma when i was a kid. she would have us use old greeting cards. love the fabric though! Oh my goodness. I made all of these paper origami boxes to enclose gifts for Christmas this year. Afterwards, I was thinking of how nice it would be if I could make them in fabric to be more lasting. Ta-dah! Thanks for the tips. Yay! Blast from my past... My Mom and I used to make boxes just like this from the past year's Christmas cards and we would hang them on a little tree. This is a wonderful, fresh use for them! Please share where to get that fabulous fabric! The fabrics are listed here in this collection. Scroll down to find the names and links. I didn't check to see if they're available there, but you can get the names and search for them elsewhere if needed. So fantastic! I am going to use this to hold favors at my bridal shower! Great project! I just wanted to let you know that we featured this project on our Facebook page with almost 15,000 fans. We’d love it if you’d use our Featured Blogger button, available at: http://www.dailycraft.com/thank-you-for-crafting/. Our audience loved the project and we look forward to sharing more from you. Please let us know if you have any questions or projects you’d love us to feature! Thanks! "So Sweet of you to Come", and the like. Quite some years ago,i stiffened fabric by diluting PVA glue with water in a large bowl,i then put in the fabric and wrung it out then pegged it to dry,and it was suitably stiffened.I made 'Doily bowls' like this, by soaking them in the solution,wringing out then moulding over an existing bowl.Left to dry, it then stiffened and made a really pretty trinket bowl for a bedroom,or a sweetie bowl.